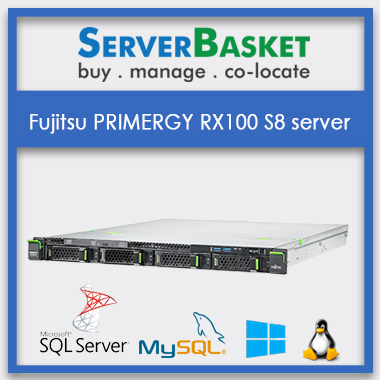 Server Basket is leading reseller of Fujitsu rack servers online at affordable prices in India. Have a glance at Fujitsu rack server models available on our website with inbuilt latest technology, processing capacity, and improved performance. Order now Fujitsu rack servers on Server Basket to experience excellent tech support and warranty. Our Fujitsu Rack servers are empowered with the latest technology to mount up in your data centers with rack frame infrastructure. We have 1U, 2U and 4U rack unit form factors with Intel Xeon E3 or Core i3 or Pentium processors to improve your server performance, with easy server maintenance and improved security features. We offer Best Fujitsu rack servers to safeguard your business from unwanted threats. Our Fujitsu rack servers are inbuilt with locked panels to secure from malicious attacks and uninvited virus. Look at the numerous rack server models with locking systems from Fujitsu to get the best security solutions for your growing infrastructure. We assure to offer improved speed and processing capacity with high-end processors and great expandable memory and storage units. With inbuilt Intel Xeon E3-1200v3 – Intel Pentium processors or Intel Core i3 processors performance is improved 6% ensuring improved infrastructure and communications. We promise to offer improved and advanced solutions to your biggest business challenges. We promise of our clients about ease of maintenance with the latest Fujitsu Rack servers. With high-end processing capacity and expandable storage, Fujitsu rack servers are benefited with enhanced usability, cost optimization, improved power efficiency, enough storage capacity and outstanding media transcoding ability and very easy to move and slide offering easier access. Rack servers are great space savers with their minimal size, occupying less office space. They can be placed one upon the other, ensuring enough airflow minimizing risk of overheating. When you are in need of more than one server for your enterprise, then go for Fujitsu rack servers with no massive chassis requirement, saving your floor area. We guarantee to offer 99.99% uptime to your business with ultimate Fujitsu Rack servers. The new virtualized systems reduce downtime ensuring flexible resource allocation and offering 99.99% uptime. Multiple network connections also improve network traffic and make faster recovery without much downtime issues. We offer you Fujitsu Rack servers along with certified warranty for spare parts and workmanship. We at Server Basket make sure to offer genuine certified warranty service to your Fujitsu servers without any hassle or dissatisfaction. Fujitsu offer certified warranty program to brand new and pre-owned servers. We offer fantastic technical support from Fujitsu team with highly certified and knowledgeable staff. We provide you with an automated call out feature on the SAN for any issues or failures with really amazing technical support service. Contact Server Basket support team via customer portal on our website to get any product details or manuals or other information.